You now see a new window (called a Runner window) and a dialog box within the window. The Runner window has a Title Bar at the top. The Runner window's title, shown in the Title Bar, is Potentiostatic EIS.EXP-. The first portion of the name, Potentiostatic EIS.EXP, is the file name of the script that is running in the Window. When an output file name is selected, its name is appended to the runner window's title. We will describe the buttons in the window, such as the F1-ABORT button, later. When you type on the keyboard, the information that you type goes to the window with the "input focus". The Title Bar of the window that has the input focus is always highlighted. Notice in the figure that the Runner window does not have the input focus. The dialog box does have the input focus, as shown by its highlighted Title Bar. The dialog box contains the parameter settings used by the experiment, controls to globally change the parameters, and controls for the dialog box itself. First, click the Default button to restore the default parameters in the event they have been modified. Clicking the Default button restores the initial parameter values as they are specified in the Gamry Explain™ Script. Now examine a few of the parameters before we run the experiment. Notice the Pstat (potentiostat) selector towards the top of the dialog box. The number of these selectors labeled depends upon the number of potentiostats installed in your system. 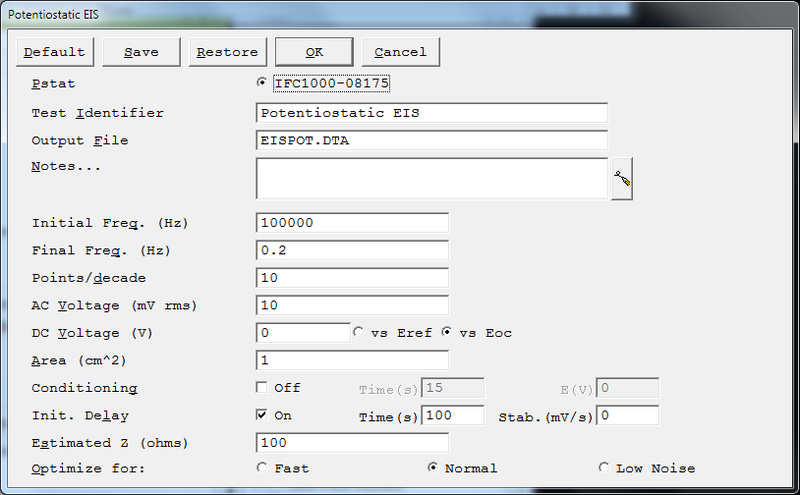 The highlighted selector indicates that the scan will be performed on that potentiostat number. Skip down a few fields, and note that the Output File field contains the file name of the output (data) file. The Potentiostatic EIS technique by default stores its results in a file called EISPOT.DTA. If the filename is not EISPOT.DTA, make it EISPOT.DTA. The two parameter fields, Initial Freq and Final Freq, define the limits of the frequency scan. The EIS software always uses a logarithmic frequency sweep. The Points/decade parameter defines the data density in the spectrum. The AC Voltage parameter is the rms excitation voltage in millivolts. The DC Voltage parameter is the constant portion of the applied voltage. The label to the right of the value currently reads vs. Eoc, indicating that this potential is relative to the cell's open-circuit voltage. If you clicked on the box next to this label, the label would change to vs. Eref. This would indicate that the potential was relative to the cell's reference electrode potential. The estimated number of points is converted to an integer by truncating the fractional part of the number. The Area, Density and Equiv.Wt parameters are used when you calculate a corrosion rate. They are specific to the sample under test. Although these parameters are not required when acquiring the data, it is often convenient to save them with the data file. The default parameter set for the EISPOT experiment includes a 100-second initial delay at open circuit. Usually the initial delay is used to allow a sample's open-circuit potential to stabilize prior to scanning the potential. The "drift rate" parameter allows you to specify variable delays depending on the stability of the open circuit potential. If the drift in open-circuit potential is less than the stability parameter, the delay ends before the time limit. The Tutorial's default drift rate is 0 mV/s. The drift rate cannot fall below zero, so the initial delay always takes the full 100 seconds. The final parameter is Estimated Z. The EIS software autoranges as it makes measurements. It does so by estimating the cell impedance and setting the hardware to measure that estimated impedance. During a sweep, the software uses the last measured impedance as the estimate of the next impedance. At the start of a sweep, it has no last measured impedance to use as an estimate. It uses the Estimated Z parameter as an estimate for the impedance to be recorded at the initial frequency. A poor guess for this parameter can cause the software to waste several AC cycles trying to find reasonable instrument settings. These extra cycles can take a long time if the initial frequency is in the millihertz or microhertz range.